I Have Who Has is a game that is played as a whole class to review. This game helps students review identifying numbers 0-30. There are two versions - one with beach theme numbers and one with regular font numbers. 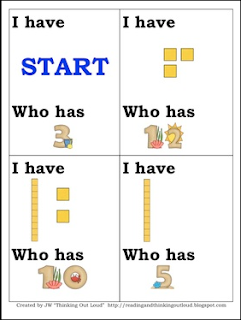 Work with numbers 11Ã¢ï¿½ï¿½19 to gain foundations for place value. two, three, four, five, six, seven, eight, or nine ones. I Have Who Has Numbers 0-30 by JW "Thinking Out Loud" is licensed under a Creative Commons Attribution-NonCommercial-NoDerivs 3.0 Unported License.Permissions beyond the scope of this license may be available at http://readingandthinkingoutloud.blogspot.com.